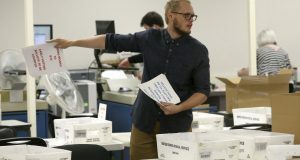 A former Arizona lawmaker has been charged with identity theft, forgery and fraud in connection with signatures on his nominating petitions when he ran unsuccessfully for the state House last year. The Pima County Attorney’s Office indicted John Kromko earlier this month on nine counts of identity theft, nine counts of forgery and one count of fraudulent scheme. Prosecutors say Kromko forged the signatures and used the addresses and other identifying information of more than 20 people in his nominating petitions. They say he also forged the signatures of the people who supposedly passed the petitions. “I needed 400 signatures and I had almost 800,” Kromko said on April 24. “It doesn’t make sense that I would bother to do that because I had so many signatures and as far as I can tell, they were all good. Kromko, 68, organized the unsuccessful initiative drive in 2007 to limit new water connections and use of effluent and ran unsuccessfully for state House District 27 against incumbent Democrats Phil Lopes and Olivia Cajero Bedford last year.